Thanks. its that time again. I just wondering who people have insurance with and rough yearly premium. Also I know I can't replace my car closest would be 535i motorsport spec or 540i manual. Haven't seen what a 89 530i m30 b30 Manual . Recaro Oem sports seats. Sunroof. 540 bumbers side skirts colour matched. 16inch basketweaves new slightly lower springs. Stut braces etc Well maintained and good condition for age all round. 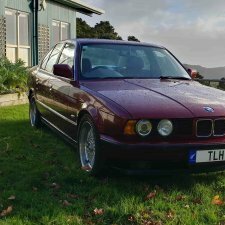 I can't find anything for sale that compares apart from the 540i in NZ. I had at 5k but I know couldn't replace for that if at all as it is UK Import. Can anyone tell me what from front end rear end to save steering arms, sways bars that you can't replace bushings or reuse so just throw away. Hey. I'm in New Zealand too. Im curious too in any surgestions anywhere in the world. I've found Ebay is great for some parts. Mainly small stuff is worth free postage clips etc rare parts. Wether EBay or BMW parts stores around world. Anything out of USA is ludicrous shipping costs I always contact the seller company to see if will look if they can get postage cost down some will some don't. From the UK I've had better luck with fair postage and Asia. Eg I'm after a lense cover for a engine bay light on my car. Pelican parts have it but a $12 part $45 to send and they won't budge on a envelope size item. Still trying other stores. BM World is great for parts in NZ always had what I needed and fair prices. What are you after for them. Or wanting to keep. Hi. Yes thanks for the help. I've done a temporary fix on it and will see how long it lasts.